First and foremost you will be given clear explanations as to what you should be eating and why, as well as, what you should not be eating and why. I believe that understanding why you keep gaining weight no matter how or what you do boils down to “what you eat.” This book will provide answers to the whys plus provide wonderful satiating recipes that are laid out for you each day to make it easy. There are over 125 recipes and you do not have to worry about the right ratios of fat, proteins and carbohydrates as I did it all for you. There are no counting calories or weighing portions, just prepare, eat and enjoy! Never diet again! The low fat high carb diets are a disaster that have never worked and never will. Kick the tasteless fake foods to the curb and allow yourself to enjoy the satisfying flavors of real food. The ketogentic diet is the way humans were meant to eat. It is simply the right balance of the macronutrients, fat, protein, and carbohydrates. Eating high fat foods, low to medium protein and low carbohydrates is the formula to ultimate weight-loss. This is the opposite of what our government’s food pyramid tells us to do. I suffered for many years with irritable bowel syndrome, and it made my life absolutely miserable. Once I began eating the foods you will find in this book, all of my symptoms disappeared! 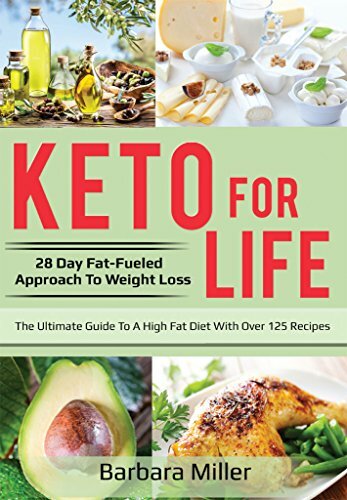 The ketogentic diet will switch your body from burning sugar or glucose for fuel to burning fat. This process puts your body into what is known as ketosis. You will notice your energy levels stay stable throughout the day as you pull your body out of a yawn state.